We appreciate your feedback about your support experience with SkyVerge, developers of Authorize.Net AIM. This helps us maintain high standards on the WooMarketplace, and helps SkyVerge improve. This Authorize.net AIM integration supports all Authorize.net merchant account regions. An SSL certificate is required to ensure your customer credit card details are safe. Authorize.net AIM does not store credit card data for future transactions. Head’s up! We’re unifying our Authorize.Net plugins to provide a better, more consistent experience for our customers. We recommend that you purchase our WooCommerce Authorize.Net plugin for the best experience. If you’ve already purchased the Authorize.Net AIM plugin, please consider contacting WooCommerce to exchange/upgrade to the unified WooCommerce Authorize.Net plugin. The Authorize.Net AIM extension provides the most integrated checkout experience possible with WooCommerce while providing the security and reliability that comes with using Authorize.Net for payment processing. Includes support for checkout using Authorize.Net eChecks and Accept.js! Authorize.Net is one of the most popular payment processors around for a reason: they offer easy, safe, and affordable credit card processing. This advanced payment gateway integration lets you take advantage of Authorize.Net for payment processing, while providing merchant tools like refunds and captures from within your WooCommerce dashboard. The AIM version of the Authorize.Net Payment Gateway extension allows you to keep the customer on your site for the checkout process, giving you maximum control over checkout so that you can test and implement the most effective experience for your store. An SSL certificate is required for PCI compliance due to the direct checkout to ensure that your customers’ credit card information is secure. Customer checkout experience is highly customizable – customers never leave your site during checkout! Use the gateway in Authorize.Net Emulation mode to allow Authorize.Net emulation by other payment processors. Using the Authorize.Net AIM extension allows you to decide what your checkout process will look like, while keeping the customer on your site for the entire process. This gives you maximum control over this experience, providing a slick checkout process for the user and maximum customizability for the business owner. 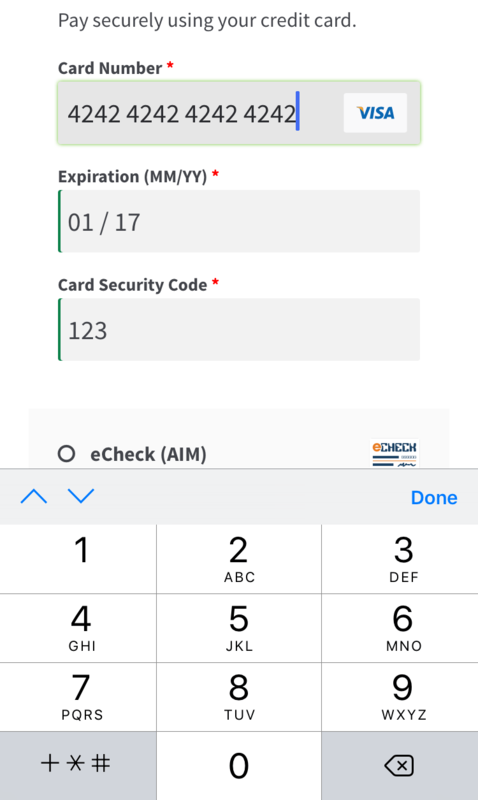 Mobile checkout is enhanced as well, offering automated card formatting and numerical (tel type) fields for easier input. You can now opt to show detailed decline messages to your customers, no more “an error occurred” error messages! 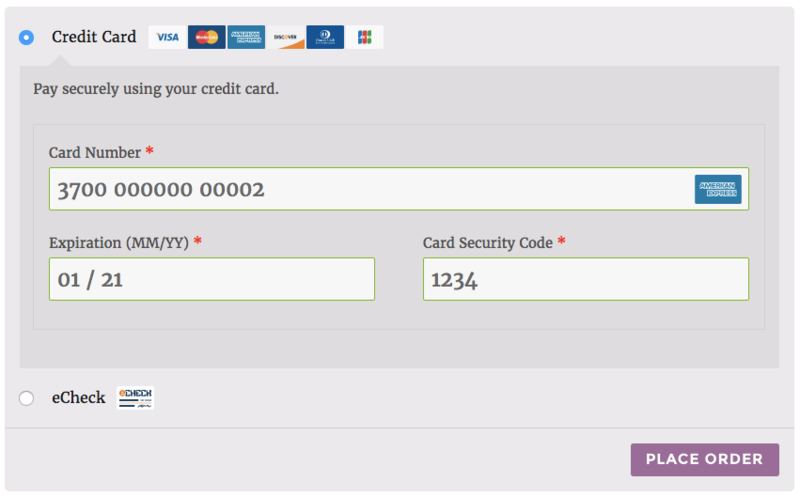 You can now enable Accept.js support for improved security in credit card payment processing! When Accept.js is used, customer credit card information is no longer sent directly through your server and instead is handled directly by Authorize.Net, meeting the lower level PCI SAQ A-EP compliance level. The customer doesn’t see a difference in the checkout process, but payment data is more secure behind the scenes. You can learn more about Accept.js here. 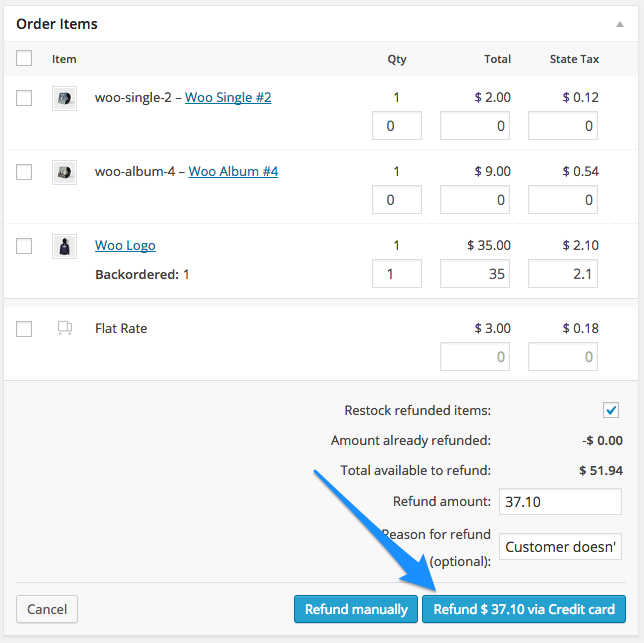 Shop employees can now process refunds for an order paid for with Authorize.Net AIM directly from within WooCommerce – no more logging into your merchant account to process refunds! Speed up your store management by creating full or partial refunds from the “Edit Order” screen and sending the transaction automatically to Authorize.Net by clicking “Refund via Credit Card”. If the transaction has not been captured or settled, a transaction void will be performed automatically instead to cancel the order. It’s possible to use the WooCommerce Authorize.Net AIM extension with other gateways that support Authorize.Net emulation (such as eProcessing Network). You’ll need to enable the Authorize.Net Emulator gateway to use Authorize.Net emulation. Customers with US bank accounts can checkout using their bank account information for a checking or savings account. To use this feature, you must have an active Authorize.Net eCheck account. Some users choose to set the payment gateway to only authorize charges rather than authorize & capture them. However, this requires the user to then log into the payment gateway admin to capture charges. This extension allows you to optionally capture previously authorized transactions directly from the WooCommerce Edit Order screen rather than logging into your Authorize.Net control panel to do so. 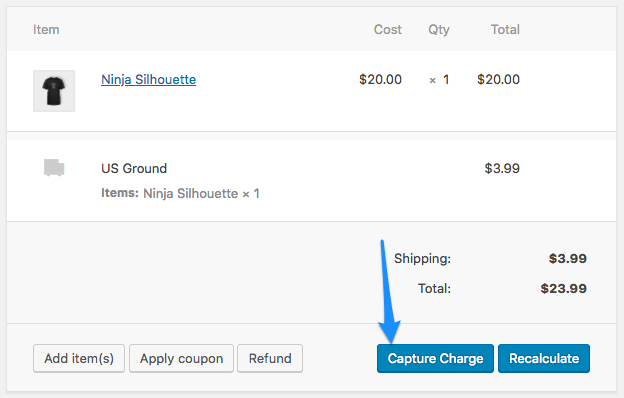 Simply edit the order, select the “Capture Charge” action, and charges will be captured through Authorize.Net. When using a WooCommerce Authorize.Net Payment Gateway, you can also avoid all of the hassle of logging in to your Authorize.Net account and running complex reports just to get a simple list of transactions. 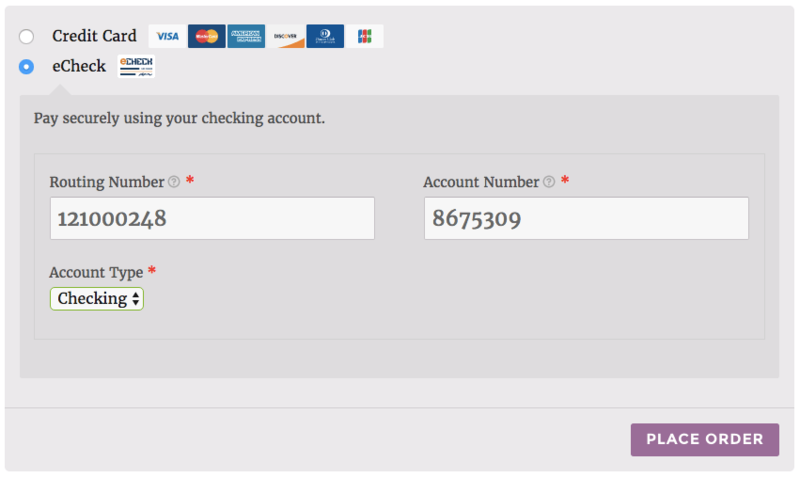 Try the WooCommerce Authorize.Net Reporting extension. After you install and configure the extension, you’ll start receiving a daily email with your Authorize.Net transactions from the previous day attached as a CSV. You can also get transactions for a range of dates easily right from your WooCommerce store! That’s it! Sit back and enjoy easy payment processing! This Authorize.Net AIM Payment Gateway allows customers to stay on your site for the transaction. If you do not want transactions through your site, please see Authorize.Net SIM. Looking for integration with WooCommerce Subscriptions? Try Authorize.Net CIM. Not sure which Authorize.Net Payment gateway is for you? Have a look at our handy comparison guide.